Support men and boys to engage in healthier lifestyle choices/activities. Encourage the early detection and treatment of health difficulities in males. 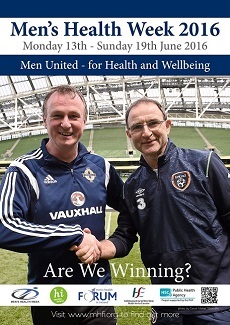 During Men’s Health Week (MHW) 2016, Michael O’Neill (The North of Ireland Team Manager) and Martin O’Neill South of Ireland Team Manager) will be the most recognised men in Ireland. The two managers have agreed to be the ‘poster boys’ for MHW this year, and to be associated with the call for everyone to unite to improve the health and well being of local men and boys. Martin and Michael are the ‘face’ of Men’s Health Week 2016 in Ireland, and will star in a nationwide poster and postcard campaign. They will also appear on the cover of the free, 32 page, ‘Challenges and Choices’ Man Manual which will be given to men across Ireland. However, it’s not only Michael and Martin who’ll be asking the question ‘are we winning?’ during the week. Everyone is encouraged to ask themselves / their organisations this question in relation to men’s health and wellbeing. The Men’s Health Forum in Ireland (MHFI) coordinates activities in Ireland and cooperates with other Men’s Fora across Europe and further afield to mark this week.